Hey guys, Maggie here! Danny let me take over the blog today to share what we buy at Trader Joe's in a typical week. 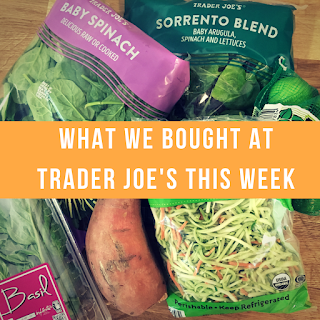 So many of you ask us what we eat throughout the day to keep our energy up and also to control cravings so I thought I'd share the things we buy at Trader Joe's in our weekly shopping trip and a few of our favorite recipes! Before we go grocery shopping, we decide on a few recipes to make throughout the week. We get nearly all of our recipes from halfbakedharvest, whose recipes are delicious and easy to make. This week we decided to make Crockpot Chipotle Pulled Pork Pumpkin Chili (substitute squash for pumpkin), Cheesy Tomato Basil Stuffed Chicken and Sweet Potato Black Bean Burgers (we substitute beef for quinoa). 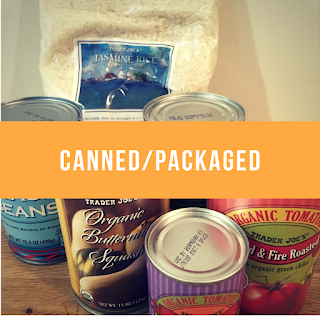 We like to change up recipes if we prefer certain ingredients over others, and that's what we've done with these recipes as well. You can also find a bunch of food pics on Danny's Instagram! Now for exactly what we bought this week! We try to keep our vegetables simple, so we always buy a bag of prewashed spinach, mixed greens, and broccoli carrot slaw. This is an easy way to get our daily dose of veggies; just throw a handful on a plate, in soup or mix it in with the rice or ground beef as its cooking. We always try to keep a bag of limes in the house (recipes, Rum drinks, and DIY coconut lime sugar scrub - find the recipe here :) ) and this week we used them in the sweet potato black bean burgers. The basil is the base for the pesto in the Cheesy Tomato Basil Stuffed Chicken and the sweet potato is a main ingredient in the sweet potato black bean burgers. The heirloom cherry tomatoes are one of the last steps when making the Cheesy Tomato Basil Stuffed Chicken. You toss them in the pan when the chicken is almost finished with some Balsamic Vinegar -- seems like a step you could skip, but don't! Really adds to the flavor and texture of the dish. We always have spicy guacamole, salsa, olives and cheese stocked in the refrigerator. They are all great additions to meals or a snack. We also use the olive juice instead of water to make rice and sprinkle olive juice on the raw greens to give them flavor. This week for cheese we've chosen a Dutch Gouda, a Double Cream Gouda (one of my favorites!) and Mozzarella. Most days we eat our lunch on the go and we also work late, so cooking when we get home at the end of the day is not an option. In light of our schedules, we try to make large dishes that will last for a few meals. For easy and quick meals this week, we've gone with ground beef; one of our favorite go-to quick meals is to saute ground beef in a pan, throw in some broccoli carrot slaw, served with jasmine rice. Another quick cooking meal is pork chops; just throw them in the broiler with a little salt and pepper and within a few minutes, dinner is served. We either have this with an Asian inspired twist with a homemade peanut satay sauce and soy sauce sprinkled on the rice or Spanish style with cheese, guacamole, and salsa. 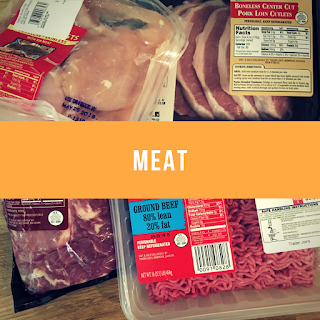 For our larger meals this week, we are making Chipotle Pulled Pork Pumpkin Chili (pork loin), Cheesy Tomato Basil Stuffed Chicken (chicken breast) and Sweet Potato Black Bean Burgers (ground beef). For the Crockpot Chipotle Pulled Pork Pumpkin Chili, we will use the fire roasted diced tomatoes, the tomato paste, and the black beans. We also use tomato paste and black beans for the Sweet Potato Black Bean Burgers. The canned squash is a substitute for the pumpkin in the Chipotle Pulled Pork Pumpkin Chili. Jasmine rice is an absolute staple in our house and we eat it every day. We eat it plain, with soy sauce or we mix grated cheese into the cooked rice for "Danny's Famous Cheesy Rice" (this is delicious and addictive so be prepared to be hooked forever if you try it!). For an afternoon snack, we sometimes have the Cherry Pomegranate Toaster Pastries with coffee. They are good to have on hand if you want a quick treat but don't want to go too overboard. Coffee because coffee is life! And we like half and half in our coffee so we always buy a few of those. We keep a French Press at the gym so we can make our own coffee (tastes better than store bought and is also cheaper! ), so we always buy an extra can of coffee and an extra half and half to take to the gym. For breakfast or a snack, we toast Ezekiel Raisin Bread with thinly sliced cheese melted on the toasted bread (we also hand press the bread a la Cuban Sandwich - so good!). For another breakfast option, we will have the Steel Cut Oats with a scoop of protein powder and cinnamon. For those times we are dying for something sweet, we love the Dark chocolate peanut butter cups (mistakenly grabbed the milk chocolate this week but we won't let them go to waste!) We also keep diet ginger ale in the house for those evenings when we have a sweet craving but don't want to indulge in candy. As I mentioned above, we always buy several cartons of half and half for our coffee. Butter and eggs for breakfast (and other recipes). Danny loves to make 3 eggs with hot sauce and Everything But the Bagel seasoning sprinkled on top. Another great snack alternative is the Greek Yogurt Coconut Cream! Really tasty and filling (get the full fat). 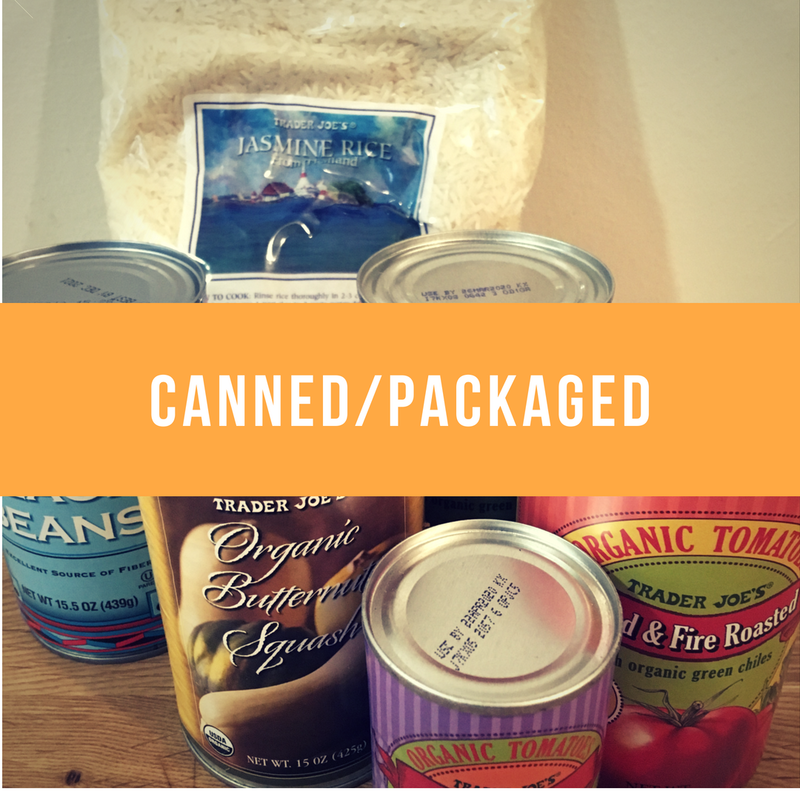 Each week the shopping list varies slightly depending on which recipes we are making for that week. Hope this gave you some ideas for what to add to your shopping list. 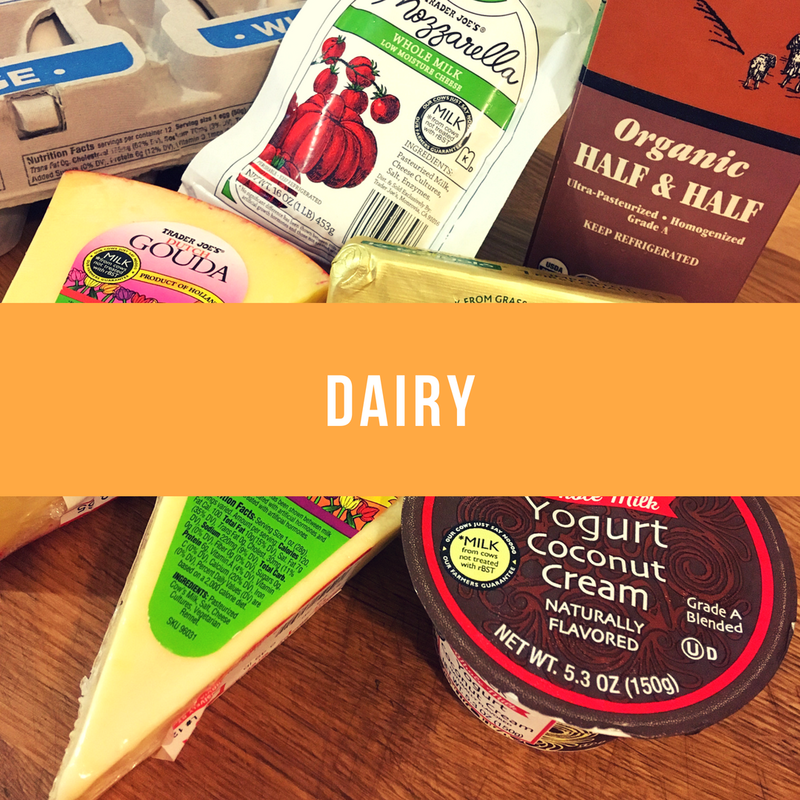 Let us know what you buy for your weekly groceries and your favorite, go-to recipes! We are always looking for new things to try!